Box Text: A fun and innovative approach to learning essential typing skills. 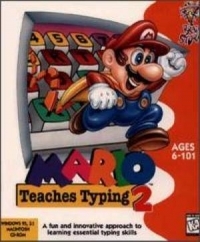 This is a list of VGCollect users who have Mario Teaches Typing 2 in their Collection. This is a list of VGCollect users who have Mario Teaches Typing 2 in their Sell List. This is a list of VGCollect users who have Mario Teaches Typing 2 in their Wish List.